Dramatic directional shifts. Living poses and postures. Vast use of second and fourth positions in plié and in extension; a reflection of chasms and gaps. Technically intricate phrase material that is simultaneously expressive, risky and surprising. Unison, canon and partnering. Diverse physical vocabulary: turned out attitude and fouetté jumps, pedestrian running, parallel assemblés, task-based gestural sequences, contorted runway walks and solar plexuses lifting in a high upper body arch. Compositional repetition acting as both an emphasis and an anesthetic. Picturesque vignettes that speak of camaraderie and shared experience contrasted with challenging tableaux of manipulation, dismissal and control. All these choreographic states and more await in Bellwether Dance Project’s Thighs and Wages, an ensemble work where contemporary performance and narrative abstraction evolve and converge. 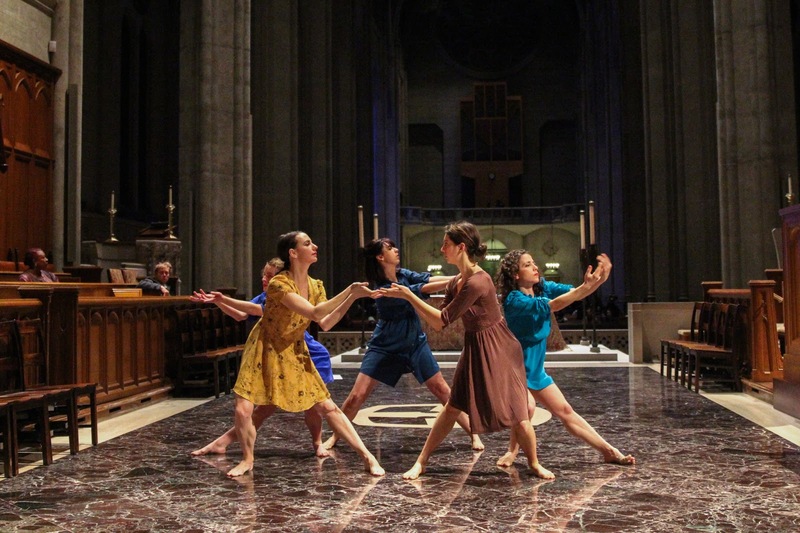 Conceived by Bellwether Dance Project’s Artistic Director Amy Foley, Thighs and Wages takes the stage in early July as part of the tenth annual SAFEhouse Arts Summer Performance Festival (SPF). Every summer, SAFEhouse Director Joe Landini welcomes emerging and established choreographic voices alike to the highly anticipated and eclectic dance event, this year held at the Joe Goode Annex. Bellwether Dance Project is thrilled to be part of 2017’s line-up, sharing a program with Linda Bouchard Multimedia Works. A lifelong dancer, Foley began taking class at the age of five and continued throughout her childhood and teenage years, particularly pulled towards ballet. And like many serious dance students, sometime in high school she started to contemplate what might come out of these years of training, “I thought, wait, I’m not going to be a professional ballerina, but there must be a place in dance where I fit in.” After taking a brief hiatus from the studio, Foley rediscovered movement at Colorado College, and specifically found a connection with modern dance. “Here, I could use my technique, athleticism and grace, though in a different context, a more grounded one – it felt like home,” she recalls. Fast forward a bit and Foley found herself in San Francisco, with the goal of dancing and performing, and eventually discovered Robert Moses’ class. Within a couple of years, she joined Robert Moses’ KIN and remained a company member for a decade. 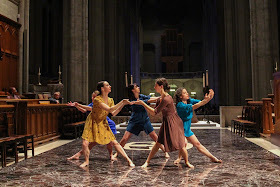 During this season, Foley also taught and freelanced with other San Francisco dance organizations, like Margaret Jenkins Dance Company and Shift Physical Theater. After her stint at Robert Moses’ KIN, Foley noticed a new artistic and creative pull within, an itch to start making her own work. Though, at the same time, she didn’t want to abandon the dancer/performer part of her being. So once again, it was time for some penetrating questions, “am I a dancer, am I a choreographer, where should my focus lie?” Like most deep inquiries, Foley found that there wasn’t one answer, and that for her, living into both roads felt right. Still continuing to perform (with ODC, and of late with RAWdance, project.b. and KAMBARA+DANCERS), she also began presenting work in a number of different choreographic outlets: ODC’s Pilot Program, LINES Ballet’s summer intensive, RAWdance’s CONCEPT series, PUSHfest, Robert Moses’ KIN’s By Series and the Dance Mission Choreographic Showcase. Over the past sixteen months, this journey in dancemaking has intensified even further, with the official formation of Foley’s company, Bellwether Dance Project, and more recently, as a Lead Artist at SAFEhouse Arts. While RAW (Resident Artist Workshop) has been a fixture in the San Francisco choreographic climate for ten years, SAFEhouse’s Lead Artist program is a brand new offshoot. “We decided this year to start moving towards an artist co-op model as a way for SAFEhouse to become more sustainable,” explains Landini, “we invited a group of RAW artists to help us run SAFEhouse in the areas of Production, Marketing, Development and Operations; six of this year’s SPF choreographers are Lead Artists.” Of course, built into the Lead Artist program is space to construct and develop new work as well as several performance opportunities. Foley’s Thighs and Wages is one of the resulting dances from her time in this creative, exploratory environment. While not a linear story, Thighs and Wages has a powerful narrative and conceptual foundation. “The piece considers and alludes to the ways that women are scrutinized and objectified; how turning someone into an object lessens their humanness,” Foley shares, “and without suggesting any answer or resolution, it challenges the viewer to contemplate the ramifications and outcomes of this objectification – abuse, violence or training women in self-doubt.” A twenty-minute work for five women, Thighs and Wages saw its premiere in November of 2016 at SAFEhouse. “I was really happy with the first showing back in November; it went well, and it also made me realize that I wanted to delve deeper into Thighs and Wages,” adds Foley. With the upcoming July performances in SPF10, she is doing just that, once again is diving into this narrative, contemporary choreography. Re-visiting any type of project brings with it such great opportunities – the chance to create new material, to edit and adjust existing parts and the occasion to possibly work with new collaborators. All of these hold true for Foley’s next iteration of Thighs and Wages. 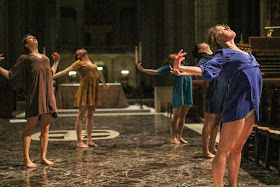 “I’m expanding the piece and creating some new ideas as well as changing some of the overall structure and phrases,” Foley describes, “and four of the five dancers are new, so it’s exciting to experience their individualism, creativity and different ways of moving in the work.” Dancers in the original cast of Thighs and Wages were Kaitlyn Ebert, Jackie Goneconti Gibbons, Emeline Le Thiec, Jane Selna and Maggie Stack, all of who also performed the work in January as part of the San Francisco Movement Arts Festival. Stack will be returning for SPF10 and will be joined by Marlie Couto, Liza Kroeschell, Courtney Mazeika and Katerina Wong. Bellwether Dance Project in Thighs and Wages - Thurs, July 6th at 8:00pm and Sat, July 8th at 8:00pm.